"It was Ms Scarlett, in The Lounge, with The Candlestick"
I hosted a Clue-themed cocktail party for my birthday this autumn. I decorated my apartment with murder weapons and signs denoting murder locations, and I served one appetizer or dessert and one cocktail for each of the six murder suspects in the classic board game. 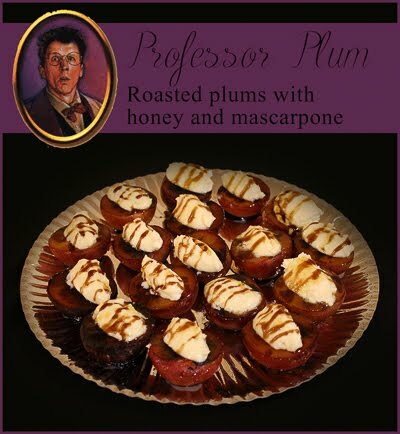 Why a Clue-themed party, you ask? Well, other than having fond childhood memories of sitting around the kitchen table, sleuthing with my family, I was at a thrift store and I happened to find a truly ostentatious candlestick (it's even customizable! This is actually only about two-thirds its maximum size!). I'm really pleased with how easy and effective the decorations were. Rope, candlesticks and wrenches are fairly mundane household items, and I crafted a knife to hang safely on the wall in a few minutes with cardboard and aluminum foil. The signs and cocktail menu were written with marker on plain old brown paper. All the decorations took me about an afternoon to put together. 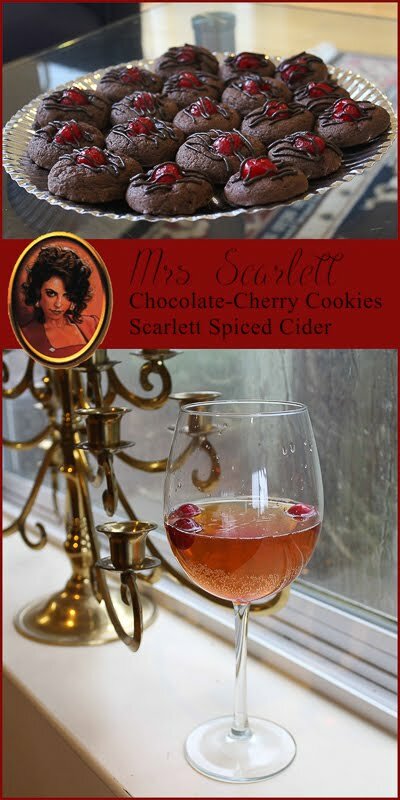 For Ms Scarlett, I made Small Town Woman's Chocolate Cherry Cookies - the chocolate and cherry combination works well for this femme fatale archetype - and served Ms Scarlett's Scarlett Spice. 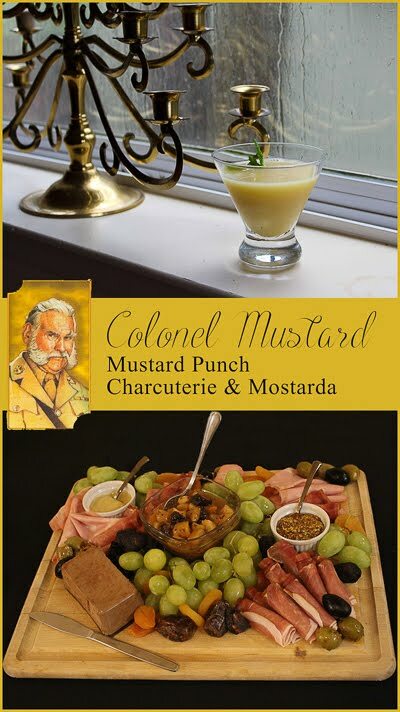 Colonel Mustard's appetizer was easy enough. Mustard and cold cuts go swimmingly together and feel at home at a cocktail party (platter assembly post here). Mustard-based cocktails are a little more unusual, but this gin-based cocktail with pear brandy worked surprisingly well. 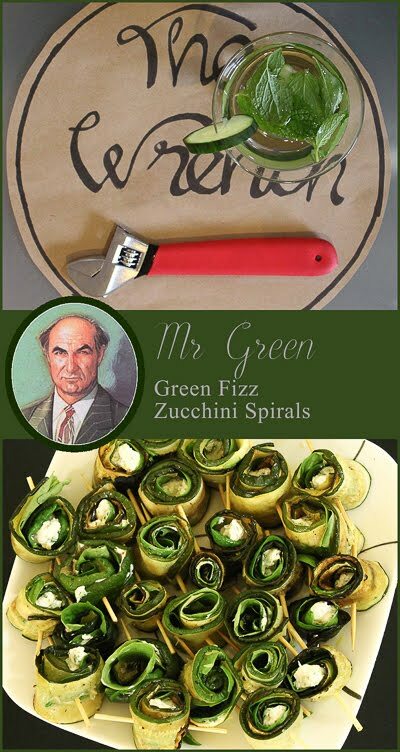 Mr Green's name lends himself well to a vegetable serving to break up the other heavier dishes. To complement the zucchini spirals, I served Green Fizz - cucumber and mint-infused sparkling water that could be spiked with vodka or another liquor of choice (water infusion recipe here - omit green food dye). 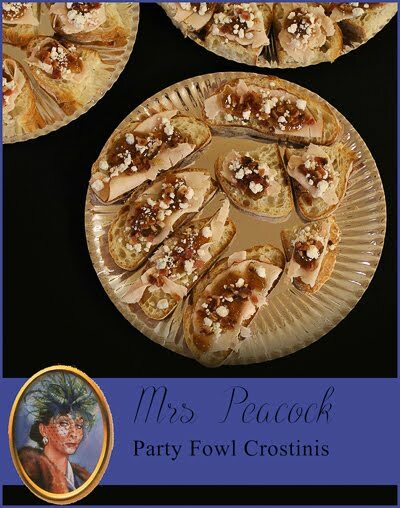 Mrs Peacock's appetizer is also based around a terrible pun: Party Fowl Crostinis. These nibbles are topped with bacon, blue cheese, chicken and fig jam - a seriously delicious combination. For the drink, I served Blue Moons, a classic variation on the aviator cocktail. 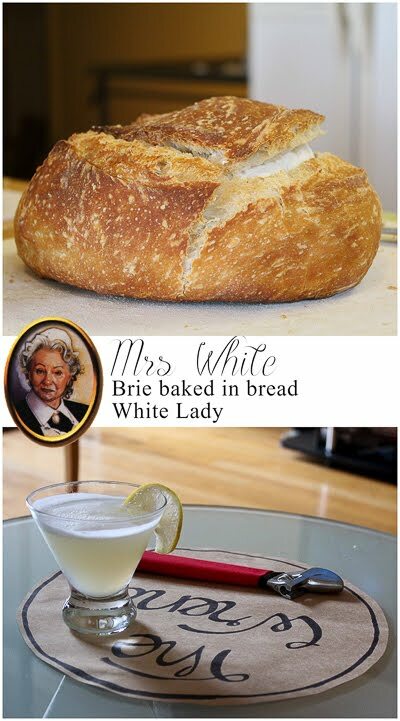 I thought this was a really effective, recognizable and simple theme for a cocktail party. 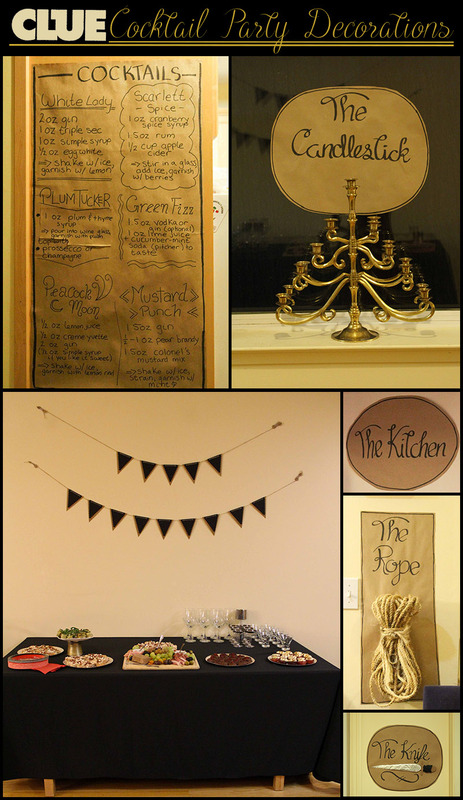 I particularly loved how well having suggested cocktails written on a brown paper menu worked - my guests were able to follow the instructions, it was a fun diversion, it looked pretty cool, and it was cheap and easy to put together. For a smaller guest list (mine was about twenty people) you could reduce the number of cocktails or dishes on the menu. I wouldn't cut out the mustard drink though - the uniqueness of it really adds to the theme! Thank you to all my friends that came out to celebrate with me, and thank you also to those who brought food or drink contributions! I'm absolutely in love with this idea, and I wish I'd seen this before my birthday (1 week ago! ), because I would have done something similar. CLUE has been my favorite game since I was a kid. So much fun!